With individuals constantly moving in and out of the state, New York’s population remains one of the most dynamic in the country. This fluidity changes the makeup of communities and the character of neighborhoods - lately, more people are leaving New York than coming, even leading the state to lose clout in Congress. Often related to economic forces, especially job opportunity, New York has seen a number of its once-bustling cities, towns, and communities economically devastated in recent years. City and state governments consistently grapple with these changes in economics, demographics, and vitality. Policymakers sometimes decide to invest in stimulating a local economy, by luring a company to move in, offering an existing company incentives to stay, or by other means. “Downtown revitalization” has become a popular term in both New York City and at the state level. As part of his Downtown Revitalization Initiative, Gov. Andrew Cuomo and his administration recently allocated a series of grants based to local communities selected by the state’s Regional Economic Development Councils. In a statement about the development grants, Cuomo explained the initiative: “A thriving downtown can provide a tremendous boost to the local economy. 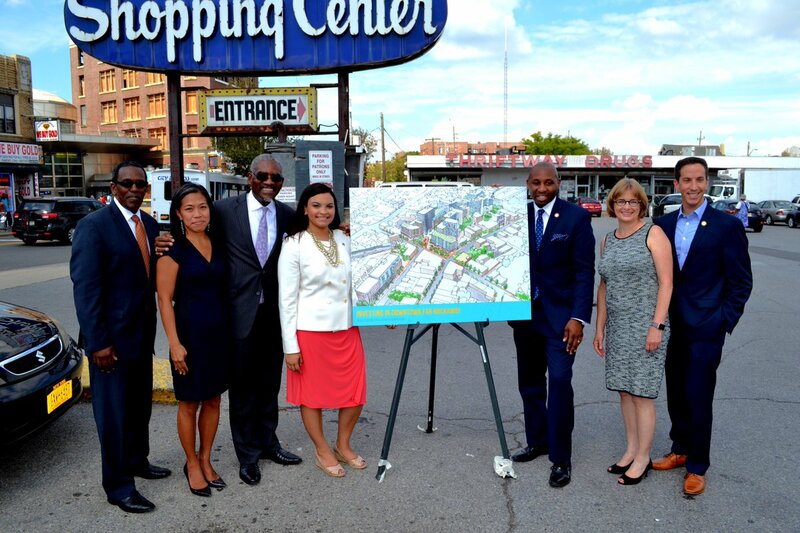 This initiative will transform selected downtown neighborhoods into vibrant places for people to live, work and raise a family.” Under this initiative, the Cuomo administration awarded 10 communities, nine in Upstate and one in the city, $10 million each. These grants are different from, though in the same vein as, the massive state economic development programs that recently came under intense criticism due to federal criminal charges that were brought against nine individuals involved. Through downtown revitalization projects, whether city or state, public tax dollars are allocated toward improving infrastructure, creating amenities like park space, and constructing new mixed-use buildings to make an area more attractive for incoming residents and businesses. While the state awarded most grants to downtrodden communities outside New York City and much of the city is bustling with commerce and jobs, there are spots where neighborhood economic development and commercial activity lag -- and in Jamaica, Queens, at least one “downtown,” the city is infusing significant revitalization funding. An active governmental role in stimulating a local economy is not a new phenomenon, especially in New York City. Since the beginning of the 20th century, all five boroughs have undergone major revitalization projects. New Yorkers have seen significant infrastructural changes in places like Long Island City, Downtown Brooklyn and East Harlem. When the government invests large sums of public dollars into redeveloping neighborhoods, tensions often arise between officials and the residents of the communities. To give residents a voice, government agencies and officials hold public information sessions and zoning hearings to explain revitalization plans and listen to concerns. The extent of the tension usually relates to how much community engagement is done in forming plans in the first place. Unsurprisingly, most residents welcome changes that would bring more jobs, improved transportation, and more facilities for families and youth. However, when the plan involves building new housing units, residents often become concerned with issues of affordability, high density, and the aesthetics of new, tall buildings. It is largely welcome news for a community that has been seeking similar city assistance for nearly half of a century. The interagency effort, led by the city’s Economic Development Corporation (EDC) and City Council Member Donovan Richards, to spur economic development and guarantee permanent affordable housing on the peninsula has been met with mostly positive feedback. Yet, some residents fear the uncertain effects of these major developmental changes, especially when it comes to new housing, created at least in part by government. For over 30 years, a shopping center at the intersection of Mott and Central Avenues in Downtown Far Rockaway sat nearly vacant. When a Dunkin’ Donuts opened there last summer, it became one of just three stores opened over decades in 30 possible storefronts. Now, a year later, the community will undergo substantial change after the EDC, the City Planning Commission, the Department of Housing and Preservation, other agencies, and state and local public officials promised to spur economic development in the area following de Blasio’s decision to invest there. Council Member Richards, who represents Far Rockaway in Council District 31 and chairs the Subcommittee on Zoning and Franchises, spearheaded efforts to acquire funding from the city for the project. Richards, a City Council member since March 2013, said the project will focus on making Far Rockaway a commercial hub again, especially making it easier to travel to and within the neighborhood. The mayor first spoke about Far Rockaway’s potential in his 2015 State of the City address. Then, in part as a response to a February 2016 letter of recommendations written by Richards and the Downtown Far Rockaway Working Group, a task force made up of local businesses and stakeholders created in November of last year, the mayor outlined his plan to invest in the community in his 2016 State of the City address. Richards said he met with residents who asked for improved access to transportation services, new youth and family facilities and more job opportunities. According to Richards, community participation has been vital in getting the mayor’s attention. The letter from the group to de Blasio, written on stationery from Richards’ office, begins with: “GOAL 1: Re-establish Downtown Far Rockaway as the commercial and transportation hub of the Rockaway peninsula,” and follows with several other goals, each with a set of specific recommendations -- many of which were adopted by the City. Under that first goal, the Downtown Far Rockaway Working Group’s recommendations point to the specifics of “downtown revitalization”: “Redevelop the shopping center site at the heart of Downtown with mixed-income housing, commercial and community facility space,” one reads. “Reinvigorate Mott Avenue, Central Avenue, Beach 20th Street, and Cornaga Avenue by attracting more diverse retail offerings with a balance of local, regional, and national businesses and restaurants that foster a walkable environment” is number two, “Create destinations to draw residents as well as visitors, including family and youth recreation and entertainment” is three, and “Highlight Downtown’s unique character and history, including as a music and entertainment destination, by fostering a “Main Street” feeling in Downtown with storefront improvements, traffic calming, lighting, and free wifi,” is four. These are followed by a recommendation to push the state-run MTA for increased A-train service and other transportation improvements. Although the city’s “Roadmap to Action” plan, which outlines the major goals of the project, elicited a positive response from residents, some remain hesitant about parts of the project, especially the housing element. As reported by City Limits, a Far Rockaway law firm, specializing in eminent domain law, sent notices to a number of residents detailing the city’s plan to acquire their properties. When this was addressed by many upset residents at a scoping hearing in September, the City explained that the potential urban renewal area is still being studied. If approved, the city said, it would affect about a dozen property owners. While the law firm made a mistake by sending these notices to many residents whose properties would not be affected, it left lasting concerns for residents about the city’s proposal. The possibility is still in the planning phases. As with other rezonings the de Blasio administration is moving forward, there are concerns about levels of affordability in housing, gentrification, and whether new development will be out of scale with the current, mostly low-rise residential community. Jonathan Gaska, in his 28th year as district manager of Community Board 14 in Queens which includes Far Rockaway, said a lot of residents worry that new 10- to 15-story residential units would take away from the character of Downtown Far Rockaway. Gaska said after Hurricane Sandy left Rockaway in wreckage, the city finally paid attention to the citizens’ grievances of the past five decades. When asked why it took so long for government to step in, Gaska said he thinks officials never saw it as a neighborhood worth investing millions of dollars to improve until Council Member Richards, who Gaska said has a “good working relationship with the mayor,” became its champion. The plan in Far Rockaway would implement the mayor’s Mandatory Inclusionary Housing program (MIH), approved by the City Council in March, which requires new construction to include permanently affordable housing. In exchange for the ability to build more units, developers must maintain affordable housing for a certain percentage of units at specific affordability rates (rental caps based on income levels and family sizes). The numbers vary based on which combination of units and incomes the local City Council member selects. Richards said he understands one of the biggest challenges about this rezoning and downtown development project remains preserving the character of the community while infusing a large amount of government resources into the area. But current zoning, according to Richards, is not working to spur growth. Governor Cuomo is also in on the revitalization efforts in Queens. Cuomo’s Downtown Revitalization Initiative awarded one of its ten $10 million grants to Downtown Jamaica, in Queens. Cuomo’s Regional Council’s chose where to provide these assets by looking at neighborhoods both in need and with the potential to develop. Queens has now seen investment from the city and state in Far Rockaway and Jamaica as both Astoria and Long Island City have become bustling residential and commercial hubs. However, as new housing and businesses come on the market, concerns have been raised about long-time residents and businesses being pushed out by increased rent prices. Mark Winston-Griffith, executive director of the Brooklyn Movement Center, a multi-issue community organizing group focused on issues related to rapid neighborhood change and gentrification, said despite the city’s possible good intentions behind economic development projects, current residents lose some control over their neighborhood during the revitalization process. According to a report on the state of housing in New York City written by New York University’s Furman Center, newly developed housing units in gentrifying neighborhoods become younger, more educated and more likely to be labeled as a non-family household (as in, occupied by single people). The study found that in 2015, only incomes of those in gentrifying neighborhoods increased. Winston-Griffith said there continues to be a legitimate fight for the right of low-income black New Yorkers to continue to live and thrive in the neighborhoods where they have lived for years. It is an issue that Council Member RIchards has raised and focused on when his committee was considering - and tweaking - the mayor’s Mandatory Inclusionary Housing program.